Receive a Free Mastersmith Series blacksmithing tutorial! SUBSCRIBE NOW! Primitive Wilderness Skills: Private walkabouts and skills intensives are available for individuals and groups. Metalsmithing: Private classes in blacksmithing and knife making are available in West Covina. Learn the ancient art of redsmithing and forge copper into accessories for both beauty and utility. Forge and heat treat a traditional, small, high carbon steel wood working knife using simple tools and a charcoal pit forge. Hand forge your own firesteel in the medieval Viking tradition and create your own flint and steel fire making kit. Revisit traditional methods of fitting knife blades that artisans of the past used without modern glues, plastic finishes, and high powered machinery. Haft your bare blade with a traditional stacked wood and leather handle, using simple hand tools for both beauty, comfort, and a personalized touch. Learn the fundamentals of primitive Iron Age technology and forge your own Viking style food knife and Colonial style iron spoon. 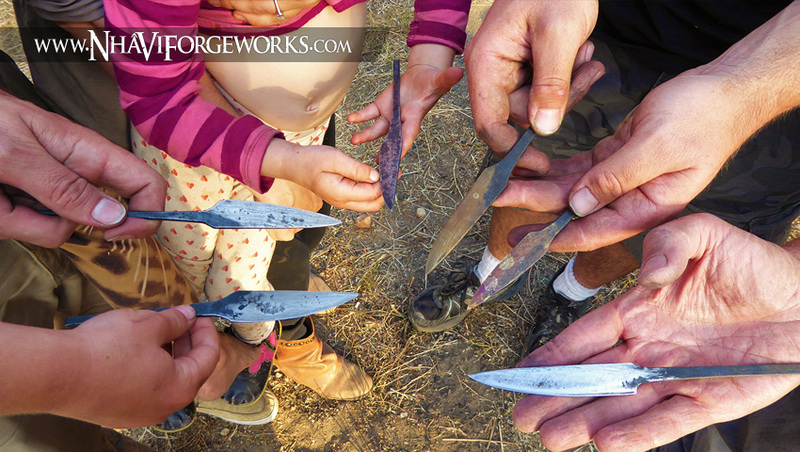 Reconnect with the ancient art of the hand forged blade as our ancestors did with simple tools, charcoal, and an earthen pit forge.